After Robert Westall's death in 1993 his agent and literary executor, Laura Cecil, discovered amongst his papers many short written accounts of periods of Robert's childhood and adult life. Lindy McKinnel, his friend and partner, decided to collate and edit all these pieces and place them in chronological order with the idea of publishing them as a book. However, because of the huge amount of material available this manuscript turned into a tome of some 300 pages and was deemed too long for publication. 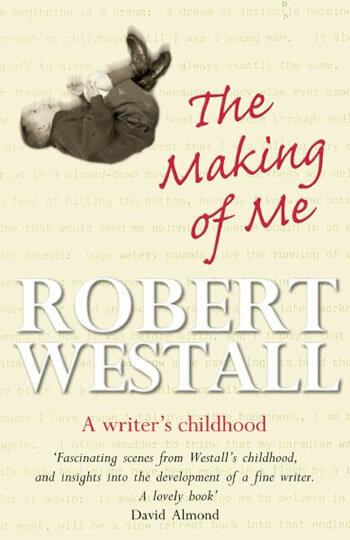 In 2005, after the establishment and opening of Seven Stories, the Centre for Children's Books, in Newcastle-upon-Tyne, one of it's galleries was named after Robert Westall in recognition of the financial contribution of The Robert Westall Trust. In addition, the Robert Westall Archive was the first to be offered to Seven Stories and a decision was made to stage an exhibition devoted to Robert Westall and his work. This exhibition took place in 2006 and used material from his Archive. Furthermore, it was felt that there might be some advantage in publishing part of The Making of Me to coincide with the opening of the exhibition. Catnip, the publishing company, produced a very much shorter version of the original manuscript which deals with Robert's childhood, in his own words, and how he came to write his first published Carnegie-winning book, The Machine Gunners. This, therefore, is the background to the book The Making of Me and it received some excellent reviews when it was published. Permission has now been granted for it to be distributed in the USA. Consideration is currently being given to publishing further extracts from the original manuscript on this website.